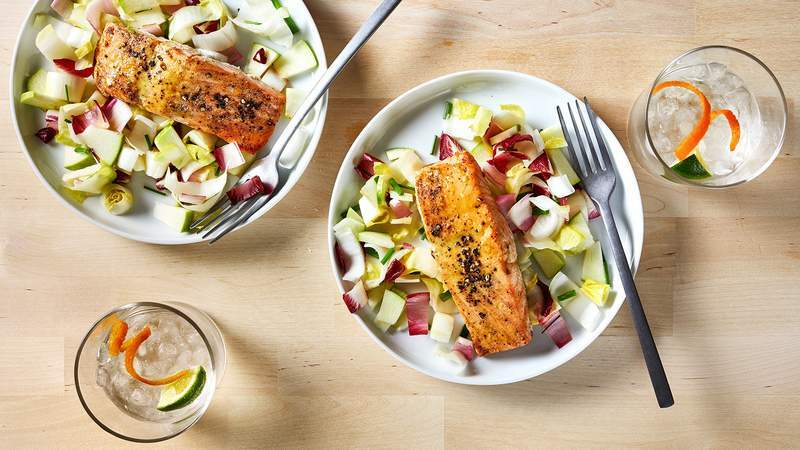 Washington Post photos Make the transition to healthy eating with Honey Mustard Glazed Salmon with Endive and Green Apple Salad. 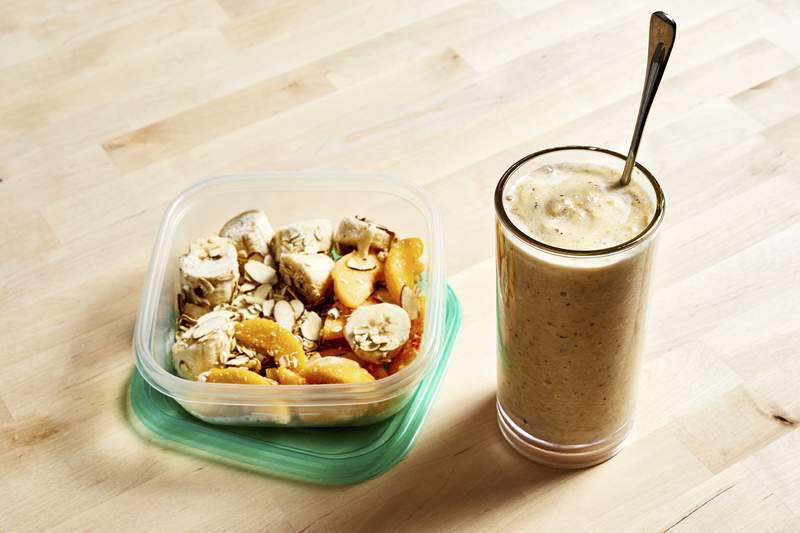 Kick your day off on the right note with a Breakfast Smoothie Pack. 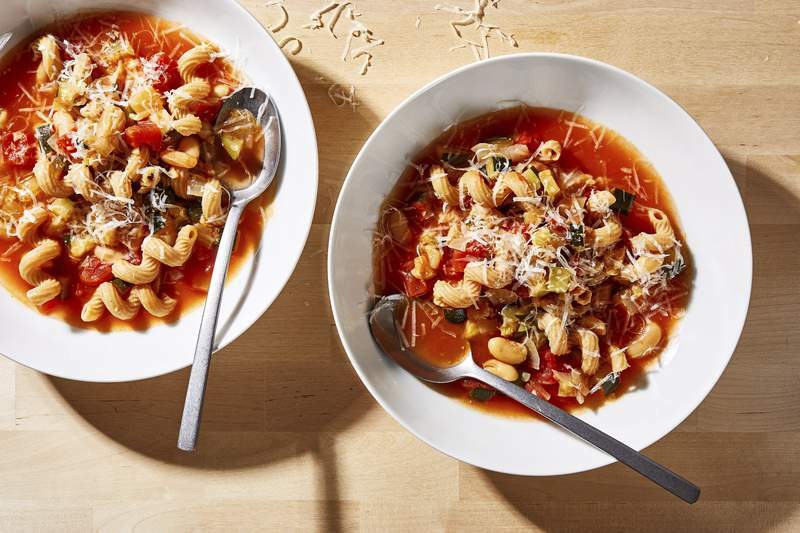 Washington Post Pasta Fagioli with Zucchini is a dish that won’t leave you feeling guilty. 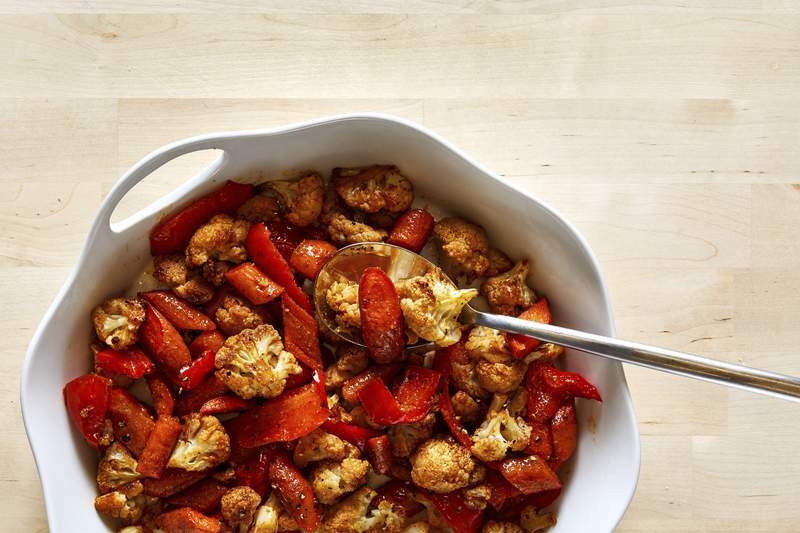 Roasted Vegetable Trio is a hearty, healthy lunch. The accompanying recipes, starting with this honey-glazed salmon, are designed to address a specific habit that can help you make a shift toward eating better in a way that is so simple and pleasurable that it will feel good to go there. Position an oven rack in the upper third of the oven (5 or 6 inches from the broiler); preheat to 400 degrees. Line a rimmed baking sheet with aluminum foil. Whisk together the mustard, honey and a 1/2 teaspoon of the lemon juice in a small bowl. Arrange the salmon fillets on the baking sheet, skin sides down, then use half the pepper to season each one. Drizzle a tablespoon of the honey mustard sauce on top of each fillet. Roast (upper rack) 10 minutes per inch of thickness. Cut the chives into half-inch pieces, then add to the bowl along with the oil, salt and the remaining 1/4 teaspoon of pepper, tossing to incorporate. This thick, milkshake-like recipe will put you on the right track for busy mornings. The idea is to fill separate containers with all the ingredients (except the milk) for an individual portion to keep in the freezer. In the morning, you just add milk and blend. The smoothies come out frothy and sweet from the ripe banana – no added sugar needed – and super-satisfying with almonds for extra protein and healthful fat, and fiber from whole fruit and oats. Make ahead: The vegetables can be prepped and refrigerated in an airtight container up to four days. Spread them out on the baking sheet; roast (middle rack) about 20 minutes, stirring once or twice, until they are tender and browned in spots, about 20 minutes. Make ahead: The pilaf can be refrigerated up to four days, and it can be reheated or served at room temperature. Heat the oil in a medium saucepan over medium heat. Once the oil shimmers, add the white/light green sliced scallions and cook 1 minute, stirring occasionally, until they have softened. Add the quinoa and cook 30 seconds, stirring, until evenly coated. Add the water and bring to a boil, then reduce the heat to low, cover and cook 15 minutes, or until the water is absorbed. Remove from the heat and allow to sit and steam (covered) 5 minutes, then uncover and fluff with a fork. Make ahead: The dish can be refrigerated up to 4 days. Heat the oil in a medium pot over medium-high heat. Once the oil shimmers, stir in the onion and cook 2 or 3 minutes, just until softened. Add the garlic and cook 1 minute more. Drain and rinse the beans, then add to the pot along with the tomatoes and their juices, the broth, salt and pepper. Once the mixture begins to bubble at the edges, stir in the zucchini and pasta. Once the mixture begins to boil, reduce the heat to medium and cook about 12 minutes, stirring occasionally, until the pasta is tender (if the pasta is thicker than elbow macaroni, it may need a few more minutes).